Visit the App Store℠ to download the free StopJetLag app. Stop Jet Lag Mobile puts scientifically researched jet lag advice, created by a jet lag travel specialist, at your fingertips. Once your Stop Jet Lag Plan is downloaded, receive easy to follow activity notifications, even on flights without Internet access. 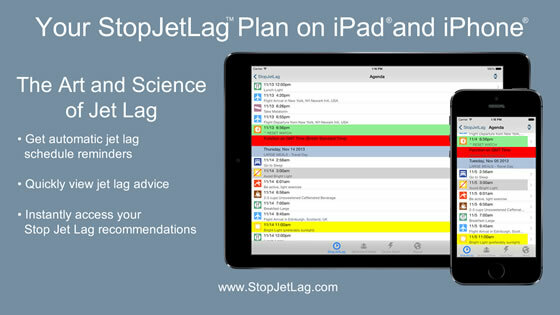 Purchase a customized Stop Jet Lag plan and access your information right from your mobile device. Your iOS 8 Mobile app makes using Stop Jet Lag even more convenient. Easily access your customized Stop Jet Lag plan on your mobile device in addition to the normal Stop Jet Lag plan pdf sent by email. Quickly adjust to the time zone at your destination using reminders that mitigate jet lag such as bright light exposure, food, sleep, exercise and optional melatonin supplements. Minimize sleep deprivation by understanding the optimal moment to switch to destination time. Stop Jet Lag considers your specific flight schedule, multi-stops and connections in relationship to your normal daily routines.